This 1870s wood framed house was renovated to modern expectations of comfort and energy conservation, while recalling a previous century. Winner of The Architectural Conservancy’s award (2010) for best adaptive re-use in Guelph-Wellington, “Carter House” demonstrates that old homes can be successfully updated, greened and future proofed for the next one hundred years. Expanding on the small 750sq ft original structure, the renovation and addition are designed to slowly reveal an interior transition from historically appropriate features, to reinterpretations of older materials and finally to more modern spatial arrangements and natural material finishes. Upon entering the custom reproduction wood door, visitors step on to original pine flooring refinished in linseed oil, exactly as it was found to first have been finished 140 years ago. 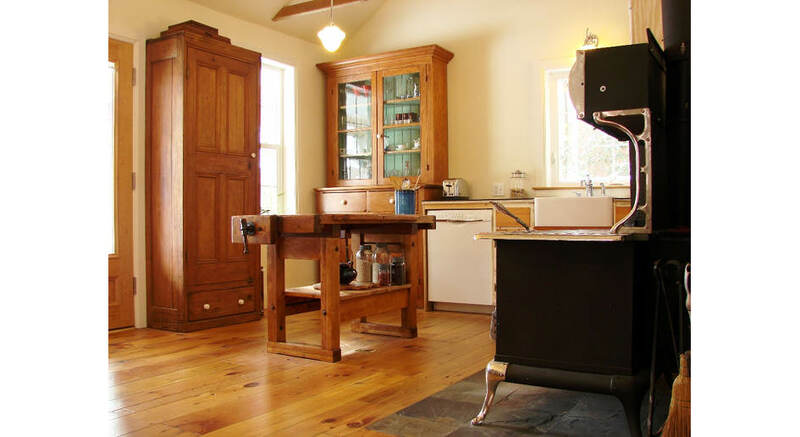 Continuing into the kitchen/dining area, a refurbished nickel and iron wood cookstove anchors the room and the time period. An antique flat-to-the-wall and pantry cabinet is complemented by newly built-in cupboards, conferring the layered history of improvements typical in old farm houses. A refinished antique wood workeing bench provides an island workspace while tin ceiling tiles have been repurposed as backsplashes, providing an industrial chic reinterpretation of heritage elements. From here comes a view in to the new addition, with bale walls, polished concrete floors and a living roof overhead. A combination of colours, textures and common elements – such as window grilles and light fixtures – visually connects the old with the new, making them a natural fit with one another. See what other exemplary features we have preserved and improved in both the description below and our ‘before’ and ‘after’ photos.